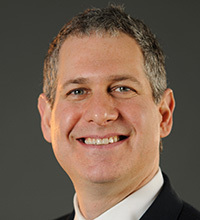 Ethan Basch, MD, MSc, is a practicing oncologist and Director of the Cancer Outcomes Research Program at the University of North Carolina in Chapel Hill. Dr. Basch’s research focuses on the use of patient-reported outcomes and novel technologies to measure the impact of interventions on patients’ experiences, and to inform decisions. He serves on the Board of Scientific Advisors of the National Cancer Institute, the Board of Directors of the International Society for Quality of Life Research, Co-Chair of the Health Outcomes Committee for the Alliance for Clinical Trials in Oncology, outgoing Chair of the Clinical Practice Guidelines Committee of the American Society of Clinical Oncology, and leads the NCI’s PRO-CTCAE initiative to develop a standard system for patient-reporting of safety data in oncology trials. His clinical practice focuses on prostate cancer. Dr. Basch received his BA from Brown University, MD from Harvard Medical School, MSc in Epidemiology from the Harvard School of Public Health, and MPhil in literature from Oxford University. He completed his oncology training at Memorial Sloan-Kettering Cancer Center, where he served on the faculty until taking up his current post at the University of North Carolina.